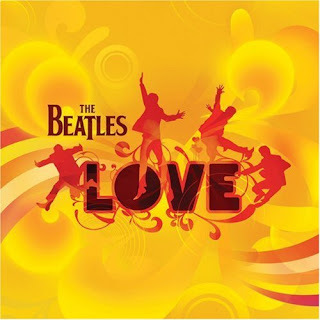 Love is a Grammy Award-winning soundtrack remix album of music recorded by The Beatles, released in November 2006. It features music compiled and remixed for the Cirque du Soleil show of the same name. The album was produced by George Martin and his son Giles Martin, who said, "What people will be hearing on the album is a new experience, a way of re-living the whole Beatles musical lifespan in a very condensed period." The DVD-Audio has longer versions of "Revolution" and "Back in the U.S.S.R.", increasing the total running time by about two minutes. The track listing for both discs is as follows: All tracks written by John Lennon and Paul McCartney, except where noted (see also: Lennon/McCartney). Love contains elements from 130 individual recordings of The Beatles. While a complete list has not been disclosed, highlights of how the elements were mixed have been noted by the press. * "Because" – An interview in Entertainment Weekly revealed that the opening track includes the bird sounds used in the World Wildlife Fund version of "Across the Universe". In addition, a new recording of a Wood Pigeon was implemented "to make it more British," according to George Martin. * "Get Back" – As reported, the track utilizes the opening guitar from "A Hard Day's Night", the drum and guitar solos from "The End", percussion from "Sgt. Pepper's Lonely Hearts Club Band (Reprise)", and the orchestral swell from "A Day in the Life". * "I Want to Hold Your Hand" – An interview with George and Giles Martin stated that elements from both the studio recording and the Hollywood Bowl live performance were mixed to create this version. * "Drive My Car"/"The Word"/"What You're Doing" – As reported, the medley features the guitar solo from "Taxman" and the horns section from "Savoy Truffle". * "Gnik Nus" – As suggested in its title, the track contains the vocal arrangement of "Sun King" played in reverse. * "Something" (with "Blue Jay Way" transition) – The track contains vocal elements from "Nowhere Man". * "Strawberry Fields Forever" – A review of the album noted that this version builds from an acoustic demo.It includes the orchestral section from "Sgt. Pepper's Lonely Hearts Club Band", the solo piano from "In My Life", the brass included in "Penny Lane", the cello and harpsichord arrangement from "Piggies" and the coda of "Hello, Goodbye". * "Within You Without You"/"Tomorrow Never Knows" – This track combines the vocals from "Within You Without You" with the bass and drums from "Tomorrow Never Knows." * "Octopus's Garden" – According to USA Today and PopMatters, this track contains the string arrangement from "Good Night", sound effects used in "Yellow Submarine" and elements from "Lovely Rita" and "Helter Skelter". * "Lady Madonna" – The song includes the guitar riff from "Hey Bulldog", Eric Clapton's guitar solo from "While My Guitar Gently Weeps" and Billy Preston's organ solo from "I Want You (She's So Heavy)". * "Here Comes the Sun" (with "The Inner Light" transition) – As mentioned by Giles Martin, the track includes backing vocals from "Oh! Darling" and a bass line from "I Want You (She's So Heavy)". * "While My Guitar Gently Weeps" – A BBC article reported that George Martin chose to use an early version of the recording for the album and wrote a new orchestral backing for the track.